Hand sanitizers, a supplement to hand washing come in different shapes and sizes and are easily available everywhere. Women carry them in their purses, and you also see them displayed in store counters. But have you ever wondered if you are getting the protection that you are paying for? These days' people are in such a hurry that they don't even make time to wash their hands. Using hand sanitizers on a regular basis is not ideal and should be used only during an emergency. Hand sanitizers are portable and easy to use but you need to keep in mind that not all hand sanitizers contain enough ethanol which kills the germs. 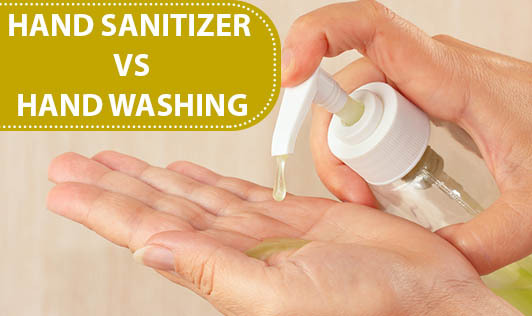 People assume that hand sanitizers are equivalent to washing hands with soap. NO! It is not a cleaning agent, and is not a replacement for soap and water. It is only a complementary habit which is quick acting but definitely not long lasting. • Alcohol based sanitizers are effective only if they are formulated with at least 60% ethanol. • It is not suitable for killing viruses such as Norovirus because it is resistant to alcohol based sanitizers. • Hand sanitizers are most effective when used in combination with diligent hand washing. • If you are using a hand sanitizer, make sure that your hands are not visibly dirty or soiled. Washing your hands with warm water and soap and intertwining your fingers is the safest way to keep your hands clean. Remember that hand sanitizers are not as effective as soap and water, and so, whenever you can, do wash your hands!